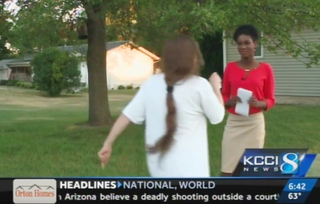 On Tuesday, reporter Emmy Victor of news station KCCI was reporting on an officer-involved shooting in Boone, Iowa, when a woman began hurling hateful racial epithets at her during her broadcast. In video footage, Victor—who is black—can be seen backing up as a white woman shouts, "Get the [f—k] out of here, you stupid [f—king n—ger]." Victor remains calm, asking the woman not to call her that. The woman, whom police later identified as the mother of the man police shot, continued and, at one point, pushed Victor before knocking the camera tripod to the ground. According to KCCI, police killed the woman's son, Michael Disbrowe, 28, after he refused to drop a gun. The station reported that neither Victor nor photojournalist Zach Hayes was injured during the incident. "The safety of our crews is critically important, as they cover stories affecting our communities,” KCCI General Manager Brian Sather said in a statement. “This morning, Emmy and Zach demonstrated the utmost professionalism in the face of a very difficult, emotionally charged situation."